It's been a few weeks since my last post, but I haven't had much dog related news to report. I spent the end of December buying and wrapping gifts, cooking and cleaning for my annual Christmas Eve Eve party, and spending lots of time with family and friends. The weather in New Jersey was absolutely ridiculous for late December. The week of Christmas was in the 70s and humid, so we definitely didn't do any running. We've had a few cold mornings since then and I was able to get Willow out for her first runs with the team. We're starting very slowly and making each run a happy, fun, easy experience for her. The last thing I want to do is stress her out, physically or mentally, while she's still growing and maturing. I recently witnessed a little bit of backlash between other mushers over when to start a dog in harness. My general rule of thumb has been around six or seven months, depending on the dog, but I couldn't remember why I had picked that age. Denali started with short, easy runs at around seven months old. Knox was around six months old. Neither have had any issues, physically or developmentally. I scoured a few mushing resources to find out what the general consensus was for starting young dogs. I found plenty of information on training puppies to line-out and to drag lightweight objects behind them, but I couldn't find anything on what age is appropriate to start running with a team. Some mushers start to harness-break a pup before he can walk in a straight line, and others wait until the pup is a yearling. If you work with a pup under five months old, do not do more than just tie a light weight to this little harness. A pup can be run in a small team at five or six months, but it is better to wait another month or two rather than risk over-stressing him. A five- to eight-month-old pup should be run only a mile or two, and certainly not over five miles, even though he can run farther when he is loose behind the team. At this point, Willy has done a few 1.2 and 1.8 mile runs with the team around the neighborhood trails. I've also taken her to Six Mile Run a couple of times, but we've done no more than four miles with lots of breaks along the way. She has been doing incredibly well since her very first run. She screams her head off at hookup and runs like she's been doing it for years. She hasn't shown any fear or hesitation, probably because she's watched the other dogs leave without her for months and she was getting tired of it. We'll continue to take things slow this season. Dexter sets the pace for us at this point, since he can't do fast sprints for very long and I don't want Willy running too hard. If it were up to her, I think we'd be running a hundred miles without stopping. Ultimately, when it comes to deciding when a dog is ready, you have to consider a lot of factors. 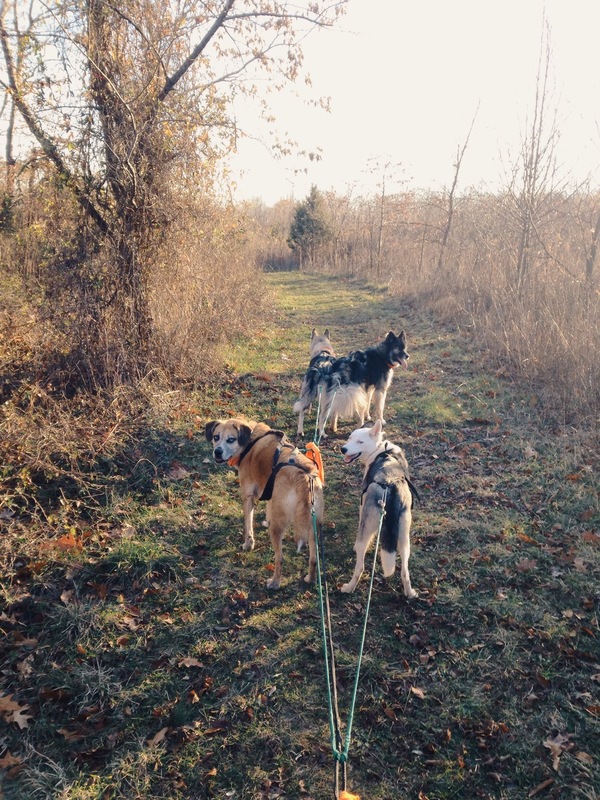 Different sled dog breeds mature at different rates. For example, I would probably wait longer for a larger breed dog -- like a eurohound or malamute. The terrain, the team, and what's being pulled also need to be considered. I wouldn't want a young pup pulling a heavy rig up and down hills. The behavior of the pup also needs to be taken into account. A puppy going through a skittish phase would probably benefit from waiting another month or two. I'm by no means an expert on this, so take my input with a grain of salt. I rely on what I've learned from other mushers as well as my own experience. I'm bound to make mistakes, but the last thing I want to do is harm my dogs.